Definition at line 66 of file flow.c. Definition at line 69 of file flow.c. Definition at line 71 of file flow.c. Definition at line 73 of file flow.c. Definition at line 240 of file flow.c. References TcpSession_::client, TcpSession_::data_first_seen_dir, Flow_::file_flags, Flow_::flags, FLOW_CHANGE_PROTO, FLOW_PROTO_DETECT_TC_DONE, FLOW_PROTO_DETECT_TS_DONE, FLOW_SGH_TOCLIENT, FLOW_SGH_TOSERVER, FLOW_TC_PE_ALPROTO_DETECT_DONE, FLOW_TC_PM_ALPROTO_DETECT_DONE, FLOW_TC_PP_ALPROTO_DETECT_DONE, FLOW_TO_DST_SEEN, FLOW_TO_SRC_SEEN, FLOW_TOCLIENT_DROP_LOGGED, FLOW_TOCLIENT_IPONLY_SET, FLOW_TOSERVER_DROP_LOGGED, FLOW_TOSERVER_IPONLY_SET, FLOW_TS_PE_ALPROTO_DETECT_DONE, FLOW_TS_PM_ALPROTO_DETECT_DONE, FLOW_TS_PP_ALPROTO_DETECT_DONE, FLOWFILE_NO_MAGIC_TC, FLOWFILE_NO_MAGIC_TS, Flow_::protoctx, TcpSession_::server, STREAM_TOCLIENT, STREAM_TOSERVER, SWAP_FLAGS, and SWAP_VARS. Referenced by AppLayerHandleTCPData(), and SMTPParserCleanup(). Definition at line 125 of file flow.c. References Flow_::alparser, Flow_::alstate, AppLayerParserStateCleanup(), and Flow_::proto. f pointer to the flow needed to be cleared. proto_map mapped value of the protocol to FLOW_PROTO's. Definition at line 1027 of file flow.c. References flow_freefuncs, FLOW_RECYCLE, FlowFreeStorage(), FlowProtoFreeFunc_::Freefunc, Flow_::protoctx, SCEnter, and SCReturnInt. Referenced by FlowGetFlowFromHash(), FlowShutdown(), FlowStorageRegister(), and TagTimeoutCheck(). Definition at line 1060 of file flow.c. 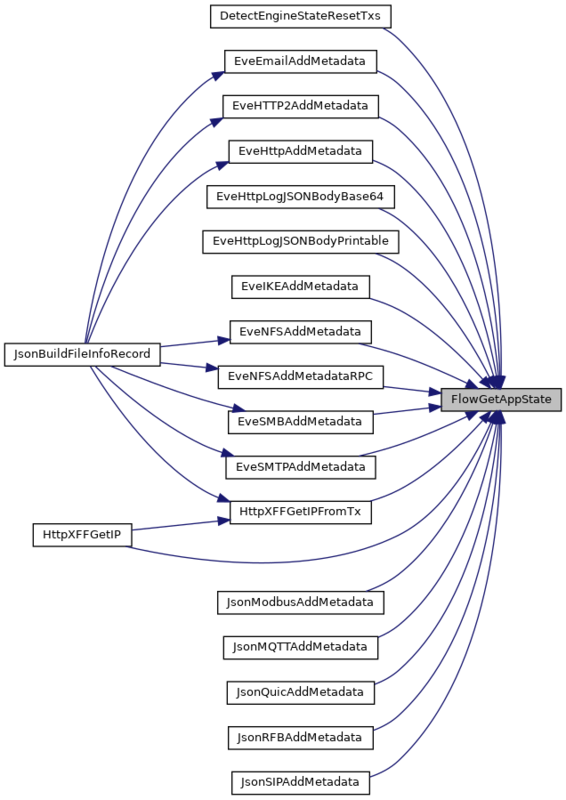 Referenced by DetectSignatureApplyActions(), SigMatchSignaturesGetSgh(), and Unified2Logger(). Definition at line 1065 of file flow.c. Referenced by DetectEngineStateResetTxs(), DetectTlsRegister(), HttpXFFGetIP(), and HttpXFFGetIPFromTx(). Definition at line 1077 of file flow.c. References TcpSession_::client, TcpStream_::flags, flags, Flow_::proto, Flow_::protoctx, TcpSession_::server, STREAM_DEPTH, STREAM_GAP, STREAM_TOSERVER, STREAMTCP_STREAM_FLAG_DEPTH_REACHED, and STREAMTCP_STREAM_FLAG_GAP. Referenced by DetectSignatureApplyActions(), OutputRegisterTxLogger(), and SigMatchSignaturesGetSgh(). Definition at line 113 of file flow.c. Definition at line 119 of file flow.c. Referenced by FlowManagerThreadSpawn(), and RunModeUnixSocketGetDefaultMode(). Definition at line 320 of file flow.c. References CMP_ADDR, CMP_PORT, Packet_::dp, Flow_::flags, FLOW_DIR_REVERSED, FlowGetPacketDirection(), ICMPV4_IS_ERROR_MSG, MAX, Flow_::max_ttl_toclient, Flow_::max_ttl_toserver, MIN, Flow_::min_ttl_toclient, Flow_::min_ttl_toserver, PKT_IS_ICMPV4, Packet_::proto, Flow_::sp, Packet_::sp, Flow_::src, Packet_::src, TOCLIENT, and TOSERVER. Referenced by FlowGetPacketDirection(), FlowHandlePacketUpdate(), and StreamTcpPacket(). This is called for every packet. Definition at line 496 of file flow.c. References Packet_::flags, Packet_::flow, FlowGetFlowFromHash(), and PKT_HAS_FLOW. Updates packet and flow based on the new packet. Definition at line 398 of file flow.c. References BypassedFlowUpdate(), COPY_TIMESTAMP, DecodeSetNoPacketInspectionFlag, DecodeSetNoPayloadInspectionFlag, EngineModeIsIPS(), Flow_::flags, Packet_::flags, FLOW_BYPASSED_TIMEOUT, FLOW_NOPACKET_INSPECTION, FLOW_NOPAYLOAD_INSPECTION, FLOW_PKT_ESTABLISHED, FLOW_PKT_TOCLIENT, FLOW_PKT_TOCLIENT_FIRST, FLOW_PKT_TOSERVER, FLOW_PKT_TOSERVER_FIRST, FLOW_PROTO_DETECT_TC_DONE, FLOW_PROTO_DETECT_TS_DONE, FLOW_STATE_CAPTURE_BYPASSED, FLOW_STATE_ESTABLISHED, FLOW_STATE_LOCAL_BYPASSED, FLOW_TO_DST_SEEN, FLOW_TO_SRC_SEEN, Packet_::flowflags, FlowGetPacketDirection(), FlowUpdateState(), GET_PKT_LEN, IPV4_GET_IPTTL, IPV6_GET_HLIM, Flow_::lastts, Packet_::pcap_cnt, PKT_IS_IPV4, PKT_IS_IPV6, PKT_PROTO_DETECT_TC_DONE, PKT_PROTO_DETECT_TS_DONE, Flow_::proto, SC_ATOMIC_GET, SCLogDebug, Flow_::todstbytecnt, Flow_::todstpktcnt, TOSERVER, Flow_::tosrcbytecnt, Flow_::tosrcpktcnt, and Packet_::ts. Definition at line 208 of file flow.c. Definition at line 512 of file flow.c. References ByteExtractStringUint32(), CLS, ConfGet(), ConfGetInt(), FlowCnf_::emergency_recovery, FALSE, FBLOCK_INIT, FLOW_CHECK_MEMCAP, flow_config, FLOW_DEFAULT_EMERGENCY_RECOVERY, FLOW_DEFAULT_HASHSIZE, FLOW_DEFAULT_MEMCAP, FLOW_DEFAULT_PREALLOC, flow_hash, flow_recycle_q, flow_spare_q, FlowAlloc(), FlowEnqueue(), FlowInitFlowProto(), FlowQueueInit(), FlowStorageSize(), FlowCnf_::hash_rand, FlowCnf_::hash_size, FlowQueue_::len, ParseSizeStringU64(), FlowCnf_::prealloc, RandomGet(), SC_ATOMIC_ADD, SC_ATOMIC_GET, SC_ATOMIC_INIT, SC_ATOMIC_SET, SC_ERR_FATAL, SC_ERR_FLOW_INIT, SC_ERR_INVALID_VALUE, SC_ERR_INVALID_YAML_CONF_ENTRY, SC_ERR_SIZE_PARSE, SCLogDebug, SCLogError, SCMallocAligned, and unlikely. Referenced by __attribute__(), DecodeICMPV6(), DecodeIPV4(), DecodeIPV6(), DecodePPP(), DecodePPPOESession(), DecodeRaw(), DecodeTCP(), DetectFastPatternRegister(), DetectFragBitsRegister(), DetectFragOffsetFree(), DetectIcmpIdFree(), DetectIPProtoRemoveAllSMs(), DetectPortHashFree(), DetectReplaceFreeInternal(), DetectSetupParseRegexes(), FlowStorageRegister(), FlowUpdateState(), ICMPv4GetCounterpart(), PreRunInit(), SCSigSignatureOrderingModuleCleanup(), SigParseApplyDsizeToContent(), TagTimeoutCheck(), TmModuleFlowRecyclerRegister(), Unified2AlertInitCtx(), and UTHParseSignature(). Function to set the default timeout, free function and flow state function for all supported flow_proto. Definition at line 720 of file flow.c. References FlowProtoTimeout_::bypassed_timeout, ByteExtractStringUint32(), FlowProtoTimeout_::closed_timeout, ConfGetNode(), ConfNodeLookupChild(), ConfNodeLookupChildValue(), FlowProtoTimeout_::est_timeout, FLOW_DEFAULT_BYPASSED_TIMEOUT, FLOW_DEFAULT_CLOSED_TIMEOUT, FLOW_DEFAULT_EMERG_BYPASSED_TIMEOUT, FLOW_DEFAULT_EMERG_CLOSED_TIMEOUT, FLOW_DEFAULT_EMERG_EST_TIMEOUT, FLOW_DEFAULT_EMERG_NEW_TIMEOUT, FLOW_DEFAULT_EST_TIMEOUT, FLOW_DEFAULT_NEW_TIMEOUT, flow_freefuncs, FLOW_IPPROTO_ICMP_BYPASSED_TIMEOUT, FLOW_IPPROTO_ICMP_EMERG_EST_TIMEOUT, FLOW_IPPROTO_ICMP_EMERG_NEW_TIMEOUT, FLOW_IPPROTO_ICMP_EST_TIMEOUT, FLOW_IPPROTO_ICMP_NEW_TIMEOUT, FLOW_IPPROTO_TCP_BYPASSED_TIMEOUT, FLOW_IPPROTO_TCP_EMERG_EST_TIMEOUT, FLOW_IPPROTO_TCP_EMERG_NEW_TIMEOUT, FLOW_IPPROTO_TCP_EST_TIMEOUT, FLOW_IPPROTO_TCP_NEW_TIMEOUT, FLOW_IPPROTO_UDP_BYPASSED_TIMEOUT, FLOW_IPPROTO_UDP_EMERG_EST_TIMEOUT, FLOW_IPPROTO_UDP_EMERG_NEW_TIMEOUT, FLOW_IPPROTO_UDP_EST_TIMEOUT, FLOW_IPPROTO_UDP_NEW_TIMEOUT, FLOW_PROTO_DEFAULT, FLOW_PROTO_ICMP, FLOW_PROTO_TCP, FLOW_PROTO_UDP, flow_timeouts_emerg, flow_timeouts_normal, FlowTimeoutsInit(), FlowProtoFreeFunc_::Freefunc, FlowProtoTimeout_::new_timeout, proto, and SET_DEFAULTS. Referenced by FlowInitConfig(), and FlowUpdateState(). Definition at line 1327 of file flow.c. References FlowMgrRegisterTests(), RegisterFlowStorageTests(), and UtRegisterTest(). Definition at line 221 of file flow.c. Set flag to indicate that flow has alerts. Definition at line 197 of file flow.c. Set the IPOnly scanned flag for 'direction'. Definition at line 186 of file flow.c. References Flow_::flags, FLOW_TOCLIENT_IPONLY_SET, and FLOW_TOSERVER_IPONLY_SET. Referenced by PacketAlertFinalize(), and SigMatchSignaturesGetSgh(). Definition at line 98 of file flow.c. References flow_config, SC_ATOMIC_GET, and SC_ATOMIC_SET. Function to set the function to get protocol specific flow state. proto protocol of which function is needed to be set. Free Function pointer which will be called to free the protocol specific memory. Definition at line 1051 of file flow.c. References flow_freefuncs, FlowGetProtoMapping(), and FlowProtoFreeFunc_::Freefunc. Referenced by FlowUpdateState(), and StreamTcpInitConfig(). Definition at line 667 of file flow.c. References BUG_ON, FBLOCK_DESTROY, flow_config, flow_hash, flow_recycle_q, flow_spare_q, FlowClearMemory(), FlowDequeue(), FlowFree(), FlowGetProtoMapping(), FlowQueueDestroy(), FlowCnf_::hash_size, Flow_::hnext, Flow_::proto, SC_ATOMIC_DESTROY, SC_ATOMIC_GET, SC_ATOMIC_SUB, and SCFreeAligned. Referenced by __attribute__(), DecodeICMPV6(), DecodeIPV4(), DecodeIPV6(), DecodePPP(), DecodePPPOESession(), DecodeRaw(), DecodeTCP(), DetectFastPatternRegister(), DetectFragBitsRegister(), DetectFragOffsetFree(), DetectIcmpIdFree(), DetectIPProtoRemoveAllSMs(), DetectPortHashFree(), DetectReplaceFreeInternal(), DetectSetupParseRegexes(), FlowStorageRegister(), FlowUpdateState(), ICMPv4GetCounterpart(), PostRunDeinit(), SCSigSignatureOrderingModuleCleanup(), SigParseApplyDsizeToContent(), TagTimeoutCheck(), TmModuleFlowRecyclerRegister(), Unified2AlertInitCtx(), and UTHParseSignature(). leaves the 'header' untouched. Interpret that based on FLOW_DIR_REVERSED flag. Definition at line 289 of file flow.c. References Flow_::alproto_tc, Flow_::alproto_ts, Flow_::flags, FLOW_DIR_REVERSED, Flow_::max_ttl_toclient, Flow_::max_ttl_toserver, Flow_::min_ttl_toclient, Flow_::min_ttl_toserver, Flow_::probing_parser_toclient_alproto_masks, Flow_::probing_parser_toserver_alproto_masks, Flow_::proto, Flow_::sgh_toclient, Flow_::sgh_toserver, SWAP_VARS, Flow_::todstbytecnt, Flow_::todstpktcnt, Flow_::tosrcbytecnt, and Flow_::tosrcpktcnt. Definition at line 230 of file flow.c. Make sure we have enough spare flows. Enforce the prealloc parameter, so keep at least prealloc flows in the spare queue and free flows going over the limit. Definition at line 144 of file flow.c. References flow_config, flow_spare_q, FlowAlloc(), FlowDequeue(), FlowEnqueue(), FlowFree(), FQLOCK_LOCK, FQLOCK_UNLOCK, FlowQueue_::len, len, FlowCnf_::prealloc, and SCEnter. Definition at line 1101 of file flow.c. References FAIL_IF, Flow_::fb, FLOW_CHECK_MEMCAP, flow_config, FLOW_DEFAULT_EMERG_EST_TIMEOUT, FLOW_DEFAULT_EMERG_NEW_TIMEOUT, FLOW_DEFAULT_EST_TIMEOUT, FLOW_DEFAULT_NEW_TIMEOUT, FLOW_EMERGENCY, flow_freefuncs, FLOW_IPPROTO_ICMP_EMERG_EST_TIMEOUT, FLOW_IPPROTO_ICMP_EMERG_NEW_TIMEOUT, FLOW_IPPROTO_ICMP_EST_TIMEOUT, FLOW_IPPROTO_ICMP_NEW_TIMEOUT, FLOW_IPPROTO_TCP_EMERG_EST_TIMEOUT, FLOW_IPPROTO_TCP_EMERG_NEW_TIMEOUT, FLOW_IPPROTO_TCP_EST_TIMEOUT, FLOW_IPPROTO_TCP_NEW_TIMEOUT, FLOW_IPPROTO_UDP_EMERG_EST_TIMEOUT, FLOW_IPPROTO_UDP_EMERG_NEW_TIMEOUT, FLOW_IPPROTO_UDP_EST_TIMEOUT, FLOW_IPPROTO_UDP_NEW_TIMEOUT, FLOW_PROTO_DEFAULT, FLOW_PROTO_ICMP, FLOW_PROTO_TCP, FLOW_PROTO_UDP, FLOW_QUIET, flow_spare_q, flow_timeouts_emerg, flow_timeouts_normal, FlowGetProtoMapping(), FlowInitConfig(), FlowInitFlowProto(), FlowSetProtoFreeFunc(), FlowShutdown(), FlowQueue_::len, PASS, FlowCnf_::prealloc, SC_ATOMIC_GET, SC_ATOMIC_SET, TimeSetIncrementTime(), and UTHBuildPacketOfFlows(). Referenced by FlowGetFlowFromHash(), FlowHandlePacketUpdate(), PacketBypassCallback(), and StreamTcpFreeConfig(). atomic int that is used when freeing a flow from the hash. In this case we walk the hash to find a flow to free. This var records where we left off in the hash. Without this only the top rows of the hash are freed. This isn't just about fairness. Under severe presure, the hash rows on top would be all freed and the time to find a flow to free increased with every run.